The relationship between demographic information and employment statistics can be ambiguous and not immediately clear – How does population growth affect employment projections? And how can this information help us plan for the future? Western Sydney University engaged .id to develop small area population, labour force and employment projections for the Greater Western Sydney region, to understand the impact of different urban forms (i.e. distribution of population and jobs) on the performance of the transport network in 2040+. To examine population and economic development in Western Sydney, .id developed an analysis of population and dwelling growth rates, spatial employment trends and labour force participation rates. The analysis was underpinned by .id’s independent state-wide population forecasts, called Small Area Forecast information (SAFi). These forecasts provide extremely granular information to show exactly where growth is occurring, from regional level to suburbs and neighbourhoods and even right down to city blocks. This locational analysis was combined this an understanding of urban economic issues including agglomeration, spatial inequality pressures, strength in densification and the importance of investment in place and complementary infrastructure on the economic performance of regions. The resulting job intensity analysis summarised in the chart below reveals what we call the ‘witch’s broom’. This highlights the job deficit challenge for Western Sydney, showing the difference between the number of local jobs and the number of resident workers. The bottom branch uses historical employment trends and extrapolates these forward to 2036. If these business-as-usual trends continue, Western Sydney will have a jobs deficit of 306,063. The middle branch uses the ratio of 0.84 jobs per resident worker (the ratio estimated at 2014) to estimate the future deficit. Under this scenario, the region’s job deficit surpasses 200,000 by 2036. The upper branch is based on the aspirational ratio of 0.94, based on employment forecasts produced by the NSW Bureau of Transport Statistics. This is the only branch where new jobs growth claws back the region’s jobs deficit. .id’s projections demonstrate that if business-as-usual continues for the next twenty years, Western Sydney will face a jobs deficit of 306,063 and a daily worker outflow of 492,521. To achieve stronger employment outcomes, major investment is required to ease the pressure on the transport network, and provide opportunities for residents to work closer to home. 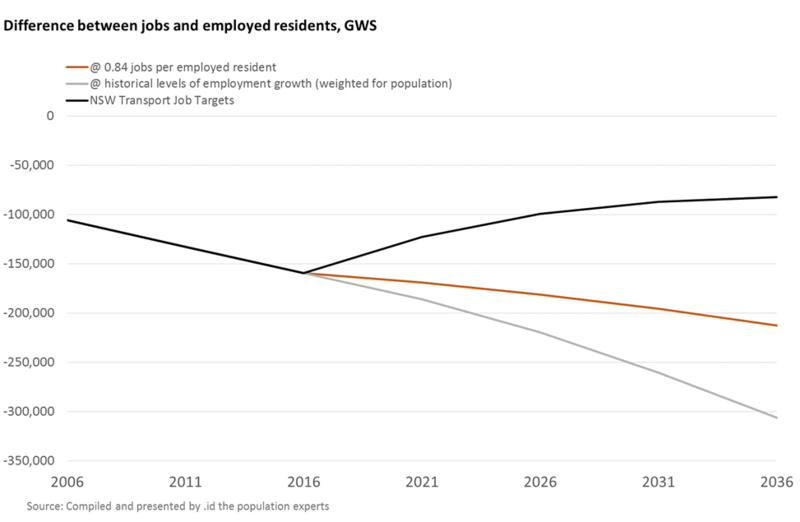 The analysis clearly demonstrates the need to reverse the gap between jobs and employed residents in Western Sydney which has grown significantly over the last decade. The findings have been presented in the report ‘Addressing Western Sydney’s Job Slide’ authored by Professor Phillip O’Neill, Director of the Centre for Western Sydney, Western Sydney University. Learn more about how we can help with economic analysis, modelling and strategic planning.